NEXT TO NONE truly are next to none. Youth prodigy bands are a dime a dozen in the realms of punk, rock n’ roll, pop and classical music of late, but never in the world of classic progressive metal has a group come forth as talented as these rising teenage performers. Featuring members all under the age of 18, NEXT TO NONE resonates with fans of progressive rock and metal legends such as RUSH and SYMPHONY X, and even the heavier spectrum of symphonic power metal, executing a polished sound with blazing skills that reach far beyond their age. The band members themselves cite current influences ranging from modern heavy metal giants SLIPNKOT, LAMB OF GOD and AVENGED SEVENFOLD, to progressive guitarists Steve Vai and Tosin Abasi, to contemporary metalcore acts A SKYLIT DRIVE and I SEE STARS. Last summer, at the ages of just 15 and 16, the young men of NEXT TO NONE recorded their official full-length debut, A Light In The Dark, released via InsideOut earlier this summer. 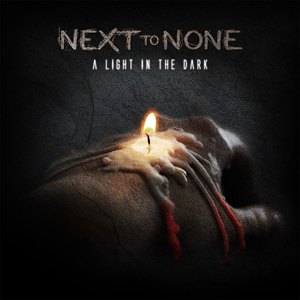 Produced by Mike Portnoy, A Light In The Dark also features guest appearances by Bumblefoot (GUNS N’ ROSES) and prog legend Neal Morse. You can order your copy of A Light In The Dark via Amazon or Radiant Records. Come witness this rising force in metal in person! NEXT TO NONE recently announced several upcoming eastern U.S. tour stops, beginning October 3rd and continuing for select dates through December 8th. See below for all upcoming tour dates. NEXT TO NONE Tour Dates: 9/12 - Amityville, NY @ Revolution 10/3 - Philadelphia, PA @ The Legendary Dobbs 10/6 – Asbury Park, NJ @ The Saint 10/9 - Hartford, CT @ The Webster 10/10 - Worcester, MA @ The Palladium 10/13 - Brooklyn, NY @ St. Vitus 10/16 - Westland, MI @ The Token Lounge 10/23 - Philadelphia, PA @ Bull Shooters Saloon 11/1 - Allentown, PA @ Crocodile Rock 11/8 - Allentown, PA @ Chicago Restaurant & Nightlife The band released a lyric video for the track "Blood On My Hands" which you can see below. Based out of the Lehigh Valley area of Pennsylvania, the band features drummer Max Portnoy, guitarist Ryland Holland, bassist Kris Rank and lead vocalist/keyboardist Thomas Cuce. At the ages of just 12 and 13, NEXT TO NONE began writing their own music and performing live around their home territory. A year later they went into the studio for the first time, recording a three-song self-titled EP. Having promoted themselves online and in their local area, NEXT TO NONE sold over 500 CDs on their own and quickly gained experience playing live and building an audience. Soon after the release of their EP, NEXT TO NONE released their breakout track “Fortune Cookie”, which featured cameos from ANTHRAX, Dee Snider, Chris Jericho and the hosts of VH1’s That Metal Show. They have continued to promote themselves through social media, gaining over 90,000 views on YouTube and over 15,000 likes on Facebook. NEXT TO NONE have been honing their live chops in support of bands such as THE WINERY DOGS, ADRENALINE MOB, VIRGIL DONATI and FELIX MARTIN, and have proudly taken part in the Vans Warped Tour and Progressive Nation At Sea 2014.